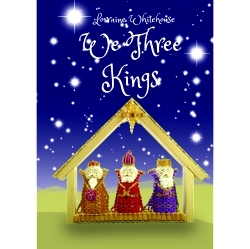 We are so pleased to present our latest Christmas creation - We Three Kings. As there are many variations in how the Kings should look we have settled on the design you see. Feel free to adjust their skin colour and beard colour to suit. Whichever way you decide it is a beautiful project to complete and I am sure you will treasure it. For those of you who want to use their own beads we have also created a wood pack containing enough wooden items to complete one Project, 1 x Santa Mould, 3 x Body Moulds and one wooden bead. If you want to complete the Project again but only need the wooden component parts, then choose this option. It contains all of the wooden components needed to complete all the Kings and their Shelter, i.e. 1 x Shelter, 3 x Body Moulds and 1 x Wooden Bead. Again, with this option there are no instructions.